MVC2 deploy - Could not load file or assembly 'System.Web.Mvc, Version=2.0.0.0, Culture=neutral, PublicKeyToken=31bf3856ad364e35' or one of its dependencies. A new MVC 2 project worked on my local machine but when it was deployed to the test server it gave the error 'Could not load file or assembly 'System.Web.Mvc, Version=2.0.0.0, Culture=neutral, PublicKeyToken=31bf3856ad364e35' or one of its dependencies.' I have the full Visual Studio 2010 installed on my local machine but just the .NET 4 framework installed on the test servers. It seems the MVC assemblies do not come with .NET 4 framework itself so how to make MVC 2 work on the test servers? Update This was written for difficulties with deploying an MVC 2 app. I have written a new blog post about deploying an ASP.NET MVC 3 web application to keep you up to date with the new technologies. When I installed Visual Studio 2010 on my local machine it came with all the fruit included (.NET4 framework, MVC2 etc) so the System.Web.Mvc.dll can be found in my machine's GAC (C:\Windows\assembly). However, since there is no need to bloat the web servers only the plain old .NET4 framework has been installed on the test servers. This does NOT include the MVC assembly and that is why it cannot be found by the web application. You need this assembly to be on your web servers that you are deploying to but you want to avoid having to copy them into the GAC manually and doing all that gacutil mess or maybe you don't have access to your servers if they are hosted by godaddy or something. If your server has .NET 3.5 sp1 installed the new(ish) assemblies System.Web.Routing and System.Web.Abstractions will already be in the GAC. If you had previously deployed an MVC 1 application to a .NET 3.5 server you may remember having to deploy the other two assemblies too. 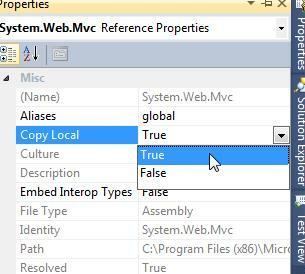 Since MVC2 requires at least .NET 3.5 sp1 you will not need to worry about these assemblies, just System.Web.Mvc. There is an easier way to do this if you are using Visual Studio 2010 Service Pack 1 and using Web Deploy as your publish action when publishing. You can add deployable dependencies to your ASP.NET MVC project that will choose the necessary assemblies for you. Even easier! Thanx, just what I needed! Thanks for the explanation. I was really struggling to get my MVC 2 app deployed to IIS 6 and didn't know if the server wasn't properly configured or if it was a deployment issue. Thanks! Deployed .net 3.5 project to GoDaddy; had to change that setting only for System.Web.Mvc. thanks for your valuable tip and was able to launch my mvc app however the images and js queries doestn seem to b working. So i turned to goggle for 'Could not load file or assembly 'System.Web.Mvc', came to britishdeveloper.co.uk (2nd in goggle by the way, before forums.asp.net), make System.Web.MVC bin deployable boom, problem solved. Im more annoyed that .NET 4.0 gave me the impression that it'd have MVC 2 innit. Thank you very much!! You saved my day. Because Aries is open-source, it is free and readily available to download. Aries has a user interface that is intuitive and easy to navigate, even for people who aren't computer whizzes.